Found on a refurbishment site. In this instance, a Prohibition Notice was served preventing any further work on the entire site until it had been tidied up and pedestrian routes established. It doesn’t take much to keep walkways and pedestrian routes clear and free from obstructions. 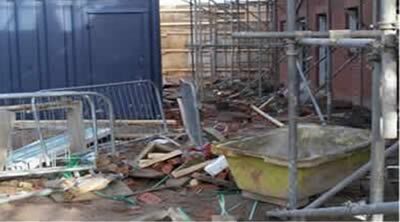 Have site arrangements for the removal of waste which everyone on site should comply with.